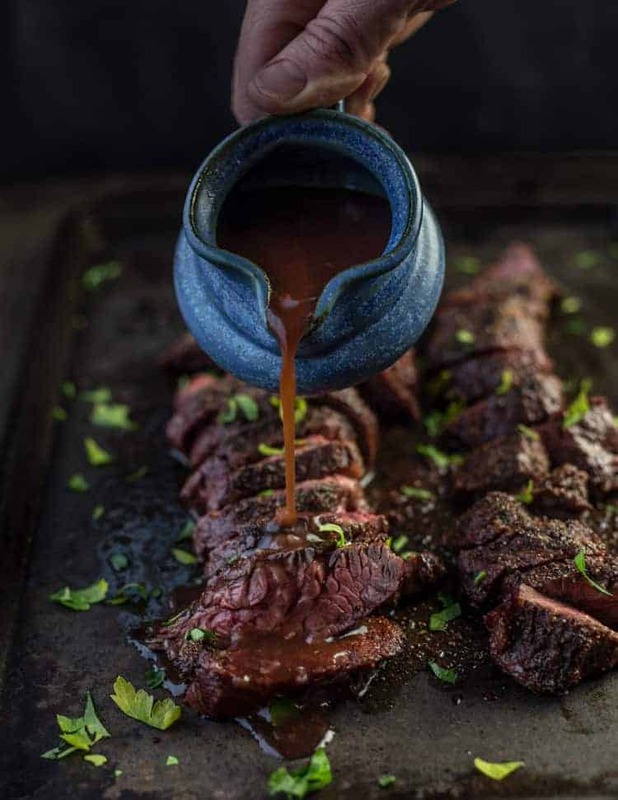 How to grill a hanger steak and finish it with a decadent red wine reduction sauce. Hanger Steaks are an affordable alternative to more expensive cuts of meat, but are full of incredible flavor. 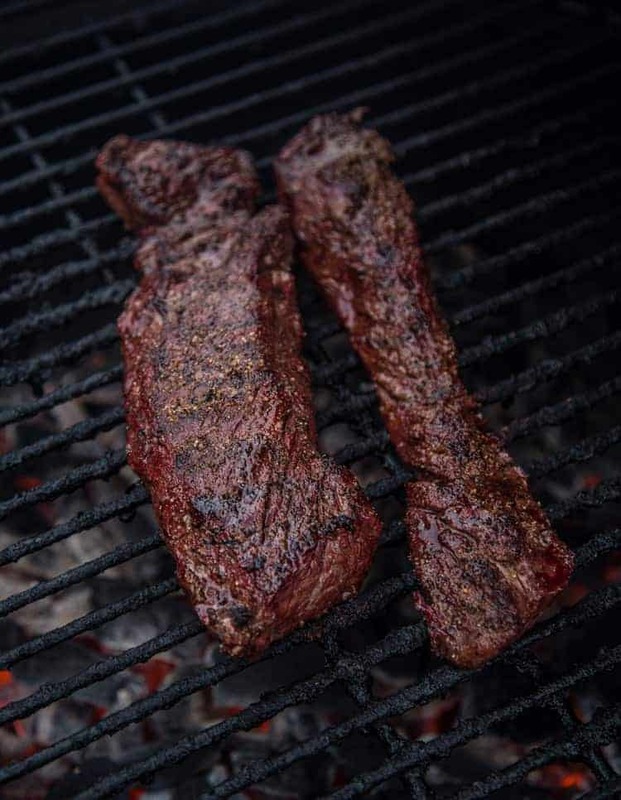 Find out how to perfectly cook a hanger steak on the grill. Hanger Steaks are a go-to around here. They’re easy to cook, super tender, take well to marinades, and substantial enough to feed the family. What is a Hanger Steak? A hanger steak comes from the section right under the rib primal with a higher fat content. 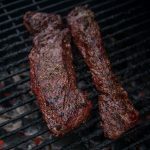 It also comes from the same place as the Skirt Steak (which is a thin, flavorful cut that takes well to marinades and best grilled at a high heat). This cut is also known as a “butcher’s steak” because consumers didn’t know about it and butcher’s kept it a secret and enjoyed it for themselves (smart butchers 😉 ). Why do they call it a Hanger Steak? It’s called a Hanger Steak because it literally hangs off the cow’s diaphragm (hence its name). Since it just hangs there it doesn’t get much of a workout, therefore it is a very tender piece of meat. Deliciously tender and perfect for a quick grill. Often we will marinate a hanger steak prior to grilling. 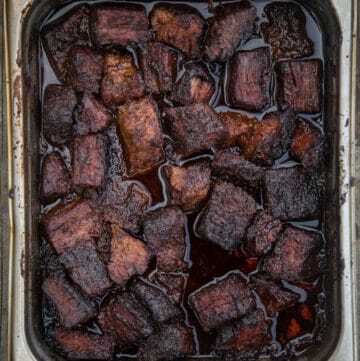 But it’s just as good simply seasoning it with salt and pepper and drizzling a red wine reduction sauce over the top after the meat has cooked. The red wine reduction sauce contains essentially the same ingredients we would use to marinate the meat with, so this is basically flavoring it in reverse order. This is also a great tip if you forgot (or didn’t have time) to marinate your meat. Set up your grill for direct cooking. 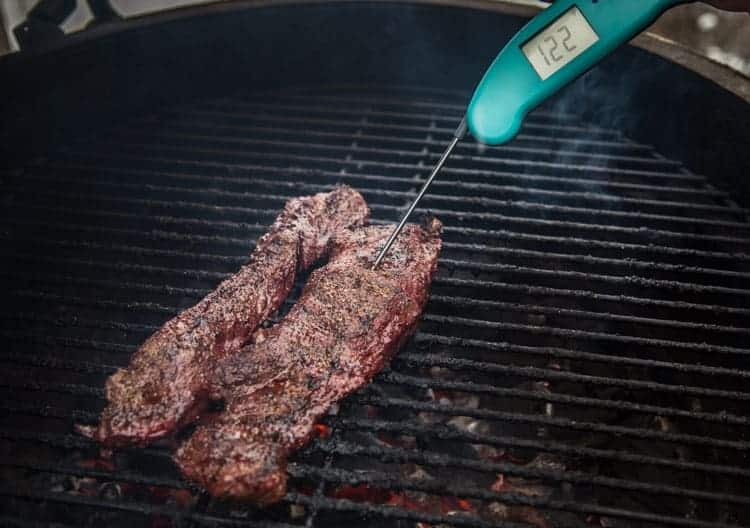 Place your hanger steak on the grill for 6 minutes per side, until the internal temperature of the meat reaches 122 – 127 degrees F with a digital thermometer (flipping occasionally). 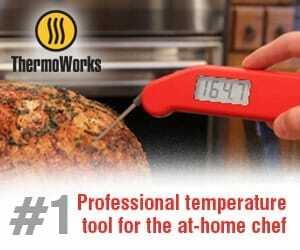 This can take longer or shorter depending on the level of heat your charcoal is putting off. If you are getting a lot of flare ups, move the meat to an indirect side after searing, close the lid and then pull at your desired internal temperature. We like the 122-127 range for medium rare. Let the Hanger Steak rest! Once the steaks have come to temperature remove them from the grill and let them rest for 10 minutes. While the meat is resting you can finish your red wine sauce. Simply add olive oil and shallots to a saucepan and let them cook about 5 minutes. Add the wine and balsamic and herbs and simmer for about 10-15 minutes until the sauce reduces by half, then turn off the heat and add in a tablespoon of butter to finish it off. Pour over your steaks and enjoy! 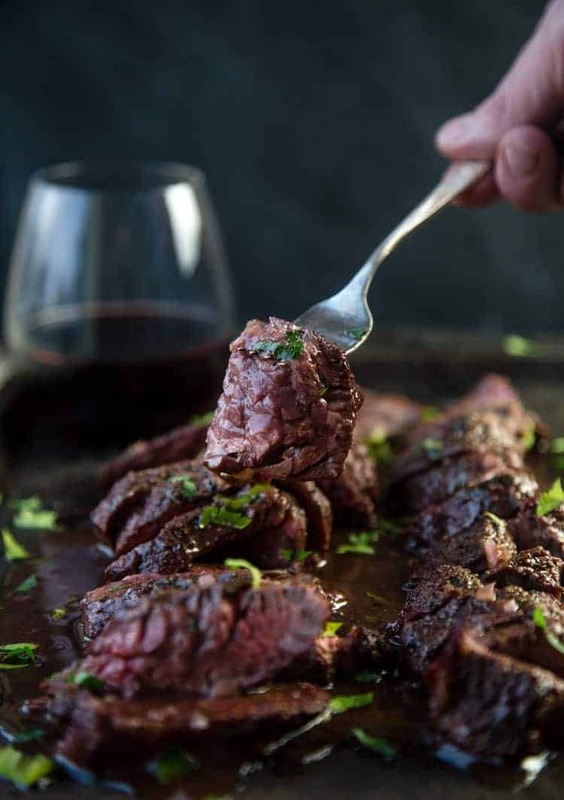 How to grill a hanger steak and finish it with a decadent red wine reduction sauce. Hanger steaks are affordable alternative to more expensive cuts of meat, but are full of incredible flavor. Prepare grill for direct/indirect cooking. Prepare steak by removing from refrigerator 30 minutes before cooking. Coat with olive oil, salt and pepper liberally. This can be done the day before. 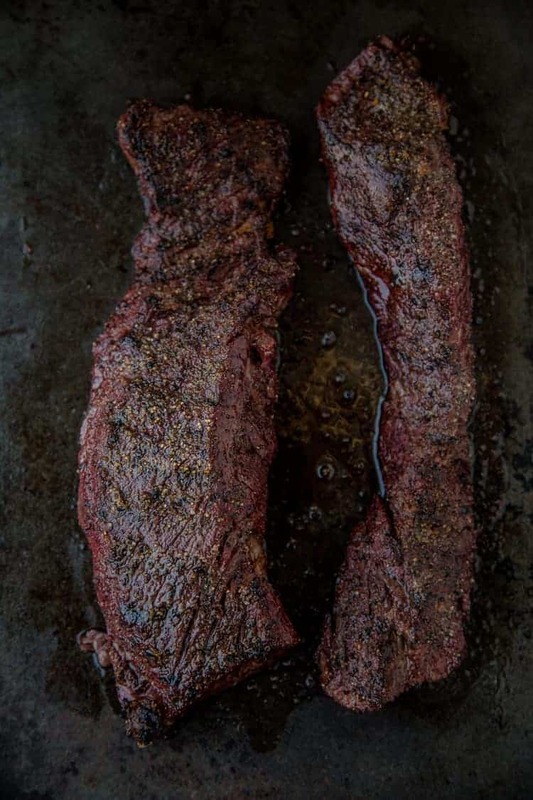 Lay Hanger steak over direct heat for approximately 5-6 minutes and then flip over using tongs. Cook other side for another 5-6 minutes until the internal temperature of the meat is around 122-126 degrees F (for medium rare). Size and thickness of steak may adjust cooking time. If flare ups, move the meat to indirect side and close lid to cook. Remove from grill and let sit for 10 minutes to let the juices settle and then cut against the grain. Pour sauce over steak for flavor. Add olive oil to medium saucepan over medium heat and add shallots, cook for up to 5 minutes. We wanted to soften, not caramelize. Then bring the remainder of reduction sauce ingredients (EXCEPT butter) to a boil in a small saucepan, and then reduce to a simmer. Let reduce to half (approx 10 minutes) and remove from heat. Immediately finish the sauce with butter, stirring, and when melted, strain to remove the shallot and rosemary pieces. The sauce will continue to thicken as it cools. Serve over slices of the hanger steak. This is an incredibly tender cut of beef and works well with a variety of red wines. The red wine reduction sauce adds richness and flavor to the overall dish and definitely should be considered too when selecting your wine. 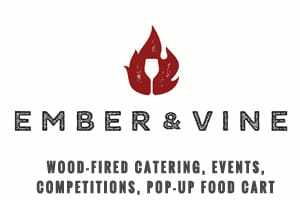 First and foremost let’s stick with red for this, and a hearty red will do nicely with the grilled meat and rich sauce. 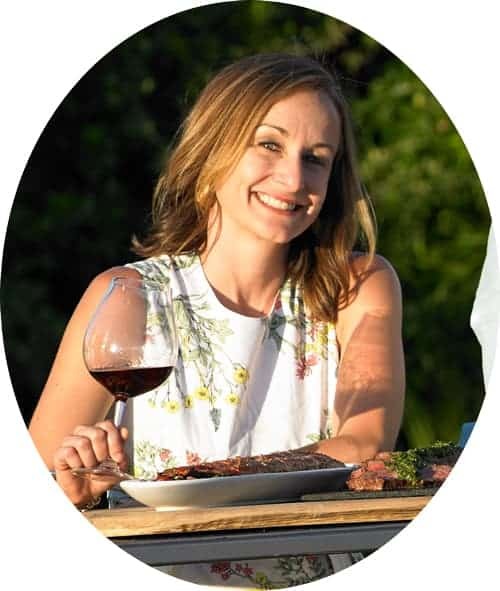 Sonoma County Cabernet Sauvignon are my favorite for this dish as they’re not overly tannic and have great rich fruit content. Other good contenders are Merlot and Malbec. 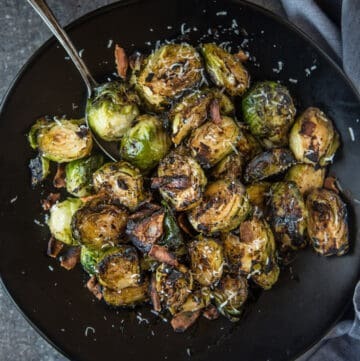 *This recipe was originally published in March of 2015, and updated in February 2019 with new photos. This looks amazing! I am definitely going to try hanger steak once it stops snowing in the Midwest! Ok, I suppose you can wait a few more weeks!! 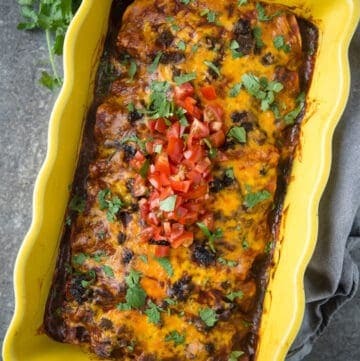 I think my husband will love this recipe! Pinning now! Now this looks absolutely amazing. I’ve never tried to cook a hanger steak at home. Thanks for the inspiration. My dad is such a steak guy, and I have no idea about anything red meat, but I *do* know he loves a good hanger steak. Great post! 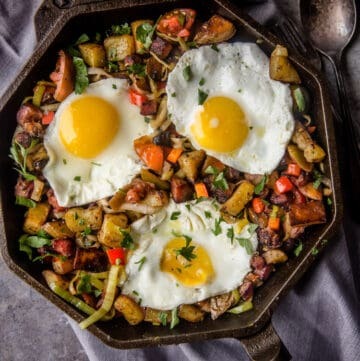 This looks so juicy and delicious, especially the red wine sauce! 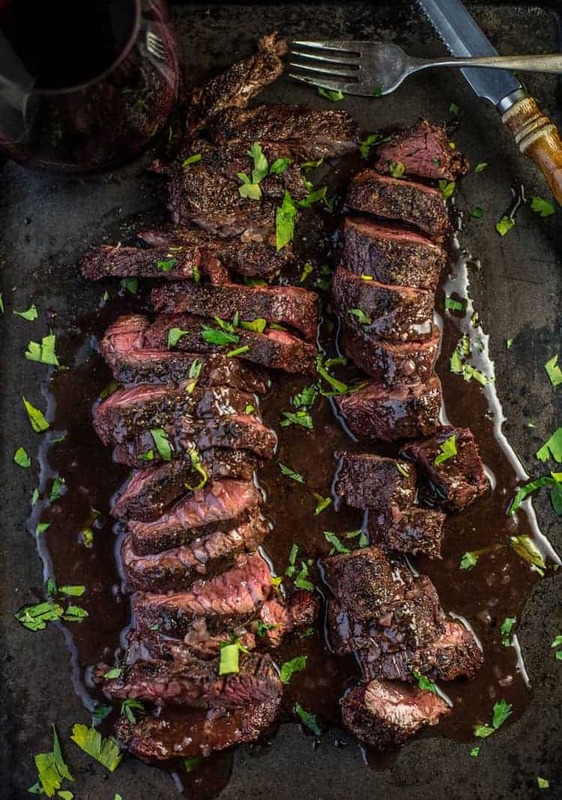 This grilled hanger steak looks SO yummy – I can’t wait to try that red wine sauce! Wow. This looks so tasty. Especially that red wine sauce. Mmmmmmm!!!! Pinned it! Thank you! Oh my, this steak looks delicious! 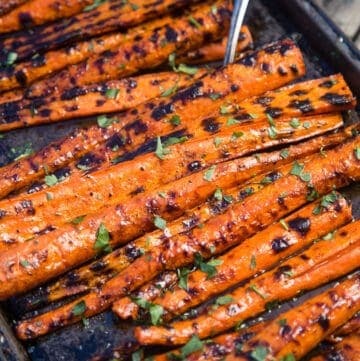 Definitely going to have to give this a try on the grill soon!